A $6 million stormwater harvesting project will capture, filter and store stormwater underground to irrigate parks and sporting grounds. One of the three projects will focus on Chelsworth Park in Ivanhoe which should be complete by December 2013. 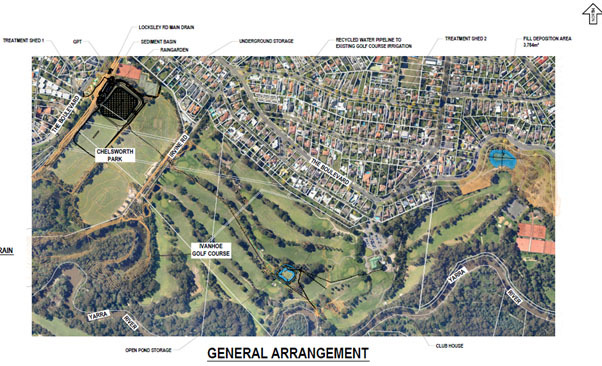 The stormwater from Chelsworth Park will irrigate the Ivanhoe Public Golf Course and Chelsworth Park. The other projects are Kalparrin Lake in Greensborough and De Winton Park in Rosanna. protection of the Yarra River and Reedy billabong from pollution including over 70 tonnes of litter, sediment including nitrogen and phosphorous. 75 megalitres of stormwater will be used in lieu of drinking water in the area. there will be no loss of open space and a safe playing surface will be produced. The project has the support of the Banyule Environment Advisory Committee and local residents. The Banyule Stormwater Harvesting Project is a partnership between Banyule City Council, the Federal and Victorian governments and Ivanhoe Grammar School, which maintains Chelsworth Park. Proposed 12 month trial “Flexicar” scheme for Heidelberg and Ivanhoe shopping centres.